"Anti-Suffragists Not to Accept Challenge," Portland Evening Telegram, March 18, 1912, 16. Mrs. Bailey Says They Will Not Debate, but Will Campaign Quietly. A meeting of the executive board of the antis was held this afternoon when plans for the campaign were outlined. The woman’s political Equality League is holding its regular meeting this afternoon at the auditorium of Olds. Wortman & Kings Mrs M. L. T Hidden, the president will deliver an address on Equality before the Law.” The next open meeting of the College Equal Suffrage League will be held at the Neighborhood House, where “Bill” Hanley of Central Oregon and Rabbi Jonah Wise will be the principal speakers. At Saturday night’s meeting held under auspices of the Men’s Equal Suffrage League Judg Gateus of the Juvenile Court. John H Stephenson and Will R. King were the speakers, all of whom agreed that the influence of women was needed in politics, Judge Gateus laying stress on what the ballot in the hands of the women would do in relation to the social evil. "Suffrage Cause is Espoused by Men," Oregon Journal, March 18, 1912, 18. The Men’s Equal Suffrage league held a meeting in the assembly room of the Olds, Wortman & King store Saturday evening, which was attended in the earlier part of the evening by about 60 people, but which toward the close attained proportions almost double as the women finished their shopping and dropped in. Attorney William Davis, president of the league, presided as chairman of the meeting, which was addressed by John H. Stevenson and Judge W.N. Gatens of the juvenile court. The members of the Anti-suffrage league were invited to be present to take part in the discussion, but failed to join in. Mr. Davis then introduced Mr. Stevenson who made the next address. Mr. Stevenson said the principal argument he had heard the antis use was that the increased cost of the elections will be prohibitive on account of the greater number of ballots that will have to be printed and of the immense amount of help that will be required to tally them. He said that though he was not a prohibitionist he believed that as the women were the most interested in this question they should settle it. Judge Gatens said that he believed, contrary to the belief held by many, that the presence of women at the polling places would cause a cessation of all loud and boisterous conduct. "Early Death Fate of Suffrage Body," Oregonian, March 17, 1912, 12. "Woman’s Club To Travel Own Road," Oregon Journal, March 16, 1912, 11. Withdraws Delegation from Advisory Committee of Equal Suffragists. As a result of what it terms contention, misunderstanding and disagreement in the ranks of Portland equal suffragists, the Portland Woman’s club campaign committee, Mrs. Sarah A. Evans, chairman, has withdrawn its delegation from the advisory committee of the Equal Suffrage campaign, which is was instrumental in organizing. This action was taken this afternoon at a meeting of the advisory committee at the headquarters of the Woman’s club committee in the Rothchild building. The reasons for this stand on the part of the club committee were set forth in communication addressed to the advisory committee and presented at the meeting. The document sets forth the work of the club committee from the time of its organization, January 12, this year, after an address by Mrs. Abigail Scott Duniway, one of the club’s charater [sic] members. The communication states that a desire to avoid waste of time, resources, energy and talent by duplication of work, was the reason for the calling together of the different organizations of the city and the formation of the advisory committee. Since then, the communication continues. “The relation of the Woman’s club to the suffrage work and the motives and acts of its campaign committee have been greatly misunderstood, misconstrued and misrepresented. “The Woman’s club is not a suffrage organization, therefore cannot be an auxiliary of any suffrage organization, either state or national, but must do its suffrage work through its own regularly appointed committee, as it does other department lines of work. Likewise its committee cannot become auxiliary, but can, and is anxious to cooperate and work in harmony with any and every other organization working for the suffrage cause. One of its legitimate fields of labor will be among the Woman’s clubs throughout the state. Suffrage as an issue has never been before the State Federation of Woman’s clubs but this committee hopes to secure the active espousal of the cause by the majority of the woman’s clubs of our state. This and other work which the committee has laid out for itself will be vigorously pursued whether or not the advisory committee continues or dissolves. "Suffrage Forces Divide: Portland Woman’s Club to Campaign By Itself," Portland Evening Telegram, March 16, 1912, 3. Declaring that it was organized “for work and not for contention,” the Campaign Committee of the Portland Woman’s Club in a long communication has withdrawn from the advisory committee organized two weeks ago for the purpose of being a general clearinghouse for the campaign work being carried on by the various equal suffrage leagues in the state and as a result it is probable that the committee will be dissolved and its work taken over by the state central committee. Friction in the ranks of the suffragists and a disposition to work independently instead of co-operating, as was proposed by the advisory committee, has, it is understood, induced the club’s committee to take the action. “At a regular meeting, January 12, the Woman’s Club of Portland, after a stirring address by Mrs. Abigail Scott Duniway, one of its charter members, adopted almost unanimously, resolutions indorsing equal suffrage and appointed a suffrage campaign committee to carry on its work for the furtherance of the cause, and voted from its treasury a monthly appropriation for the period of the campaign, the committee pledging itself to finance any expenditure over and above the monthly appropriation. As soon as headquarters were secured the committee as a body called upon Mrs. Duniway to pay its respects to the veteran leader and advise with …Finding her too ill…depart with best wishes for her speedy recovery. In the meantime, other groups of women had organized suffrage leagues and for the advancement of the cause and to avoid waste of time, resources, energy and talent by duplication of work, the Woman’s Club campaign committee called together the leaders of these and of the Men’s Equal Suffrage League, for mutual conference, which conference resulted in the organization of a local advisory committee. Mrs. Duniway’s personal representative being present and participating in the proceedings, and the state honorary president herself, making the motion to organize such committee. “In politics, state central committees welcome the aid and co-operation of county committees, and this Advisory committee was planned with no thought of assuming any executive or authorative [sic] functions, which all will concede, rest with the state body. “The relation of the Woman’s Club to the suffrage work, and the motives and acts of its campaign committee have been greatly misunderstood, misconstrued, and misrepresented. “The Woman’s Club is not a suffrage organization, therefore cannot be an auxiliary of any suffrage organization, either state or National, but must do its suffrage work through its own regularly appointed committee in like manner as it does other department lines of work; likewise its committee cannot become auxiliary, but can and is anxious to co-operate and work in harmony with any and every other organization working for the suffrage cause. 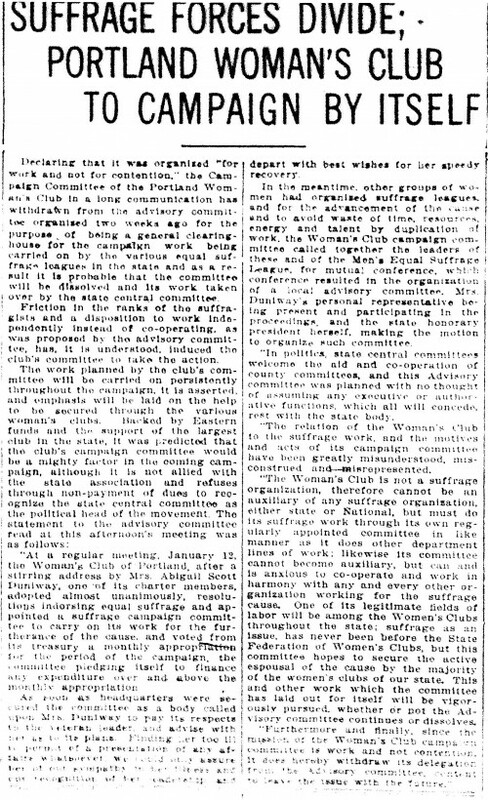 One of its legitimate fields of labor will be among the Women’s Clubs throughout the state; suffrage as an issue, has never been before the State Federation of Women’s Clubs, but this committee hopes to secure the active espousal of the cause by the majority of the women’s clubs of our state. This and other work which the committee has laid out for itself will be vigorously pursued, whether or not the Advisory committee continues or dissolves.